Tyrel and Joana brought their gifts to Samaritan's Purse international headquarters during national shoebox collection week. When Joana received a gift-filled shoebox in the Philippines in 2000, she couldn’t have imagined that one day she would meet the 7-year-old boy who packed the box—and that he would be her future husband in America. Seven thousand miles and 14 years later, Joana and Tyrel Wolfe tied the knot October 5 on a cattle ranch in Idaho. If their story sounds like a fairy tale or a Hollywood movie, it isn’t. No one is more surprised than the newlyweds themselves. The Wolfes shared their remarkable journey Monday after dropping off Operation Christmas Child shoeboxes at Samaritan’s Purse headquarters in North Carolina during the first day of National Collection Week. The boxes were wedding gifts packed by friends and relatives. 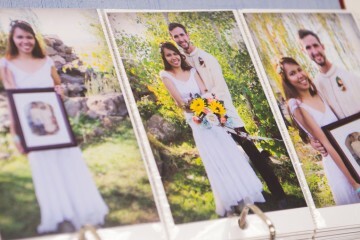 Joana loved the idea and included “Pack a Shoebox” brochures with every wedding invitation. Some guests brought boxes; others gave a donation. The couple transported the boxes all the way from Idaho, en route to contracting jobs Tyrel has this month as a state park trail system developer in North Carolina and Tennessee. Although there are shoebox drop-off locations in Idaho, the Wolfes agreed it would be more meaningful if they delivered the boxes to Samaritan’s Purse headquarters. 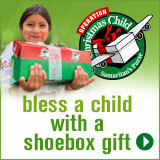 In many respects, that experience would take their own shoebox journey full circle. During the summer of 2000, Joana received a shoebox at a Vacation Bible School graduation ceremony in Quezon City, a suburb of Manila. 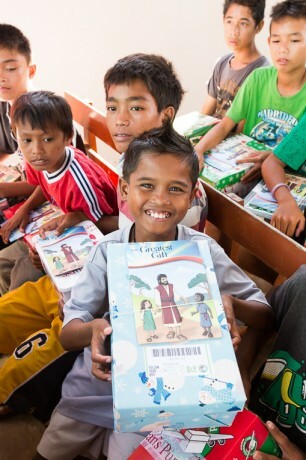 Children in the Philippines hear about the good news of Christ when they receive shoebox gifts. The gift represented far more than a mere collection of fun gifts. It was through the box that she had heard a presentation of the Gospel and accepted Jesus Christ as her Savior. Not long afterward, her father also received Christ and eventually followed the calling God put on his heart to become a pastor. Joana kept one memento: a small photo of a little blonde-haired boy in a cowboy shirt holding a lariat. The boy had included his name and address, so Joana later wrote him a letter explaining how his gift had impacted her and her family. Joana mailed the letter, but for whatever reason, Tyrel never received it. Fast forward to November 15, 2011. Joana decided to see if she could find the person who packed her box through Facebook. “I still wanted to thank the person who gave me the box that had meant so much to me,” she said. The only information she had to go on was a name: Tyrel Wolfe. Numerous options appeared when she did a search. One name popped up from Idaho. The child in the photo was dressed in cowboy-type attire with a rustic mountain background. She had never been to the United States, but she knew that Idaho had mountains. Was this Tyrel Wolfe the one? She clicked on the link and submitted a friend request. Thus began their Facebook friendship and an exchange of letters and pictures for the next year. The more they corresponded, the more Tyrel and Joana found they had in common. They were both passionate about music—albeit different styles—and both sing and play at least one musical instrument. And Joana had always dreamed of a quiet life in the country. Despite the 15-hour time difference and busy schedules, they would set aside a couple of hours in the morning and again at night for daily Facebook visits. But if their relationship was to progress, it was obvious they needed to see each other in person. Tyrel and Joana were married in Idaho in October. In June 2013, after saving up money for a plane ticket and receiving cautionary blessings from his parents, Tyrel flew to Manila. He had been on an overseas mission trip before, but had never been to Asia, and had never traveled by himself. There were some nerve-wracking moments when he couldn’t find Joana and her family when he landed, but an airport employee saw the distressed young man and showed him where to go. Tyrel stayed for 10 days and got to know Joana in her home environs. Prior to the trip, they had agreed not to officially date until Tyrel asked her father’s permission in person. Midway through his visit he finally gathered up enough courage to ask the protective dad and pastor. Joana’s father gave his approval without hesitation. Tyrel returned to Idaho fully determined to go back to the Philippines. He took on extra hours as a trails- and bridge-builder at area state parks, saving every dollar he could in order to visit Joana during the holiday season. This time he stayed for a month. At last he was ready to pop the big question—not to Joana, but to her father. Speaking in the Tagalog language, he asked her dad for permission to marry the girl of his dreams. 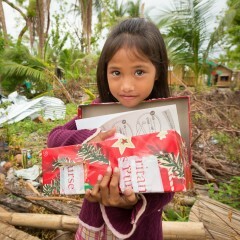 Tyrel and Joana plan to keep packing shoebox gifts like the one that impacted her life. The couple held an engagement party in the Philippines and spent the next several months working with the U.S. Embassy to obtain a fiancée visa for Joana. Finally in early September, Joana was on a plane bound for Idaho to begin a new life. Their wedding ceremony took place outside on a beautiful October day on Tyrel’s parents’ 400-acre ranch. While his brothers dressed up in starched white shirts, jeans, and cowboy hats, Tyrel’s attire included a barong, the traditional embroidered shirt worn by Filipino grooms. Now six weeks into married life, Tyrel and Joana are looking forward to their first Christmas together in the United States. They have started a tradition that they hope to continue every year for the rest of their lives—packing shoeboxes for Operation Christmas Child. “And when we start having children, we want to involve them in packing boxes too,” said a smiling Tyrel as he held his wife’s hand. “I remember as a little boy, I was so excited to know the toys and other items I put in the box would bring joy to another child somewhere else in the world.